Successfully Added Wholesale Hand Held Metal Detector - Extra Sensitive Setting to your Shopping Cart. Wholesale priced Handheld Metal Detector with very sensitive metal detecting ability. It is so sensitive that a small penknife can be detected at 6 inches, and even a 25 cent piece will be picked up at 45mm. You can select different metal indication modes, or set the Metal Detector to low sensitivity to better screen dangerous metal objects. This item provides reliable detection for security purposes. This portable professional metal detector can be used in a variety of scenarios, from airport security to night clubs and bars. 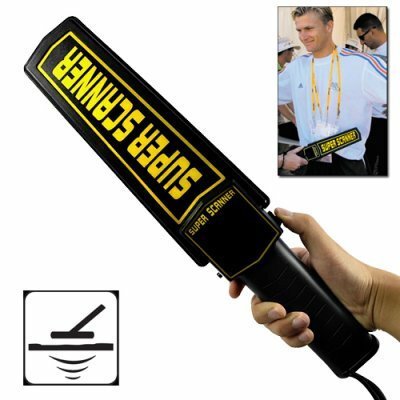 This is a powerful handheld portable metal detector that is available commercially for the average user. Cut down knife related incidents in your entertainment establishment/business and deter away those who seek to ruin everyone’s enjoyment and fun. This metal detector will provide you with peace of mind. So now you can get back to enjoying running your club or bar without the worry of constantly looking out for people that are up to no good. If you are in need of screening for weapons, or sell to those that do, this Metal Scanner is a great way to be safe and not spend a fortune doing so. The CVETM-PRSCAN is in stock now. So get one today for personal/company use, resale market, online or physical store or your Ebay shop. This item is available to you at factory direct price from the leader in wholesale electronics, Chinavasion. IP 54 rated - Good for use outdoors or indoors.